Children's book author Ruth Freeman loves visiting schools and libraries! Visits and talks are tailored to your specific community, interests, and age group. I love visiting schools and libraries! Visits and talks are tailored to your specific community, interests, and age group. Topics can include: writing fiction vs. nonfiction, how I get my ideas and how you can get yours, the fun of doing research and editing, the publishing process. Using my new book, One Good Thing About America, I have spoken to groups about the writing process, why I chose to write with letters, and how to find characters. One activity that everyone enjoys (because everyone plays a part) is to show the whole publishing process from the spark of an idea in an author’s head to the finished product of a book. There is nothing more fun than helping students discover they can write creatively. Topics include: how to get ideas, the importance of asking questions, using great words, the messy first draft, dialogue, and setting. Fees are negotiated on the basis of time, group size, number of groups, and travel to and from the destination. Children will get much more out of an author’s visit if they have had some preparation ahead of time. It helps if they are familiar with the author’s books and have had time to think about the subject and about questions they would like to ask. Any needed equipment discussed ahead of time must be available (things like a microphone, screen, outlets). There should be breaks in between groups of children. I can talk for about three hours but then I need to give my voice a rest! One Good Thing About America: My publisher, Holiday House, is offering an excellent Educators’ Guide at this link: Educators’ Guide. In addition, topics for discussion and activities can include writing letters, writing about a time you were new (is it ever easy? ), a contest for the craziest examples of the Crazy English language, writing about the one-good-things that make you happy, hearing from newcomers in your community, trying to communicate without using words. Underwear: Through your local library, you can usually find a reprint of a Montgomery Ward or Sears catalogue from the 19th or early 20th century. The underwear, and prices, are fascinating. Look at the pictures of corsets. Imagine women (and men) shaping their bodies this way. Why did they do it? How do we shape our bodies today? Much of the story of underwear is about commodities: linen, cotton, wool, silk, whalebone, rubber, nylon, and spandex. Find out where each one comes from and the work involved in turning them into underwear. Ask older relatives what they wore for underwear when they were young. Local historical societies often have pieces of antique clothing and underwear. And take a look at the websites listed at the back of the book. How Sweet It Is (and Was) Candy is usually bought in a store today, but years ago it was made at home. There are three recipes at the back of the book. Candy companies work hard to invent new types of candy. If children were candy designers, what would their brand new candy look like, taste like, feel like? Can they design a package to catch people’s eyes? Can they come up with advertising slogans? Making gingerbread or graham cracker houses with icing and LOTS of kinds of candy is always fun, as is making sculptures from toothpicks and gummy candies. Hairdo! Hairstyles show a lot about who we are (or would like to be). Have the children bring in photographs of themselves. Using cut-out hairstyles from magazines or scanned images from history books, the children can try many different styles on their photographs and see how they would look. 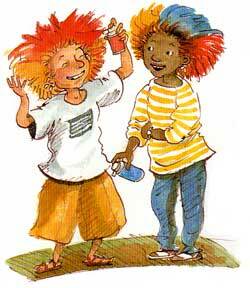 Children can do their own research by asking older relatives and friends how they wore their hair. Bedtime! Look at the last page where the boy has his bed just the way he likes it. What would your perfect bed look like? What will beds look like in the future? How many different kinds of beds have you slept in?